You're a Nimmo. In a pond. You have to shoot thousands of little bullets that look like bugs into killer lily pads. Why? Because you want to get to another pond... and to survive another day. In a different pond! The first thing you'll notice when you start up the game is the noise it makes. It's pretty annoying, and won't stop until you hit Start Game. Just mute your speakers, you won't be needing sound; trust me, it doesn't help. The controls are simple. Use the up arrow key to move forward and the left/right arrow keys to rotate left and right. However, I highly recommend that you only use your left/right arrow keys! Moving the Nimmo around with the up arrow key will cause you to drift around, and you can't stop. This increases your chances of getting hit by lily pads, and you don't want that. Staying in one spot in the center of the screen and simply rotating is the best strategy to avoid losing health. Hit the space bar to fire bullets. You can upgrade the strength of your bullets throughout the game by collecting power-ups; there are five different strength levels, 1 being the weakest and 5 being the strongest. Note that you have to keep hitting the space bar to fire bullets, and that holding the space bar only fires one bullet. Press B to use bombs. They're useful for getting out of tight situations, like destroying huge, fast-moving lily pads that are hurtling towards you! At the beginning of the game, you start with 3, so use them only when you need to. You can obtain more bombs from power-ups, which I will explain in the next section. Press V to make the Nimmo stick its tongue out, which enables you to collect power-ups. You have to be facing in the direction of the power-up to collect it. Here's a list of all the power-ups you can get in the game, along with a comment about its usefulness. You might want to follow my advice on which ones to collect! Gives you more health. Very, very important! Always grab these. Gives you more paddle power. Useful only if you need it, as you recharge your paddle power throughout the game anyway when you're not using your arrow keys. Gives you another bomb. Always collect these when you can, because they can save you from losing health! Multi-shot bullets that allow you to shoot 3 bullets at once. GET THESE. 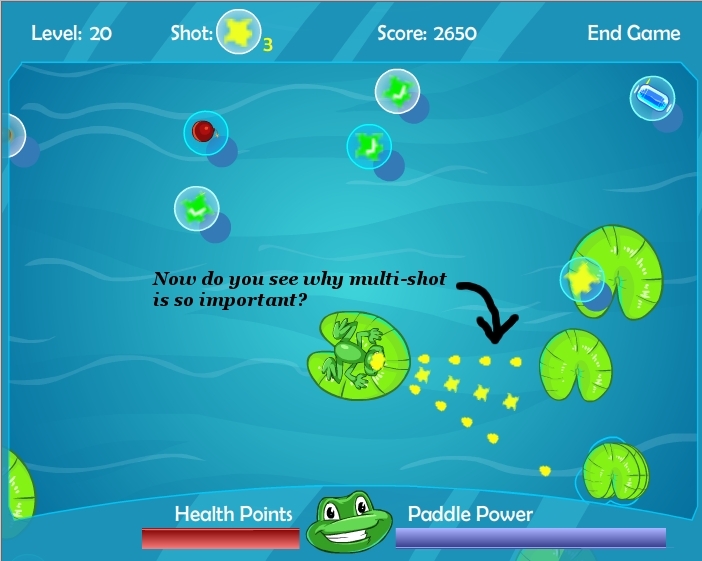 It makes your life much easier, as you don't have to aim precisely to hit the lily pads! I recommend upgrading to shot level 3 for the most efficient range. Upgrade to 4 or 5 if you want a wider range. Super-powered bullets. DO NOT GET THESE. Absolutely atrocious, they fire in an arc and cannot hit lily pads about to crash into your poor Nimmo! Resets your speed, stopping you in your tracks. You won't need this, unless you've accidentally tapped on the up arrow and you're drifting a bit. I know there are a lot of power-ups and they can be kind of difficult to distinguish at first, but with practice you'll get used to only looking for the ones you need. Important notes about power-ups: When power-ups do appear in-game, they tend to move in a diagonal direction, often fairly quickly. Don't try and go for them, just wait until the desired power-up is within your tongue's range. Remember, you have to be facing the power-up to get it! Also, the power-ups will float around for a while before they eventually disappear, and carry on into later levels. Be careful when trying to collect some of them; they tend to change spontaneously, and one mistake can cost you your game! So, you've read up on the controls and the power-ups, now it's time to get playing! You can set your game size to regular or large, whatever works for you. Quality doesn't matter, but if your computer is slow, set it to medium. Below is a screenshot of what your screen would look like after destroying a couple of lily pads. Remember, you shouldn't move from the center of the screen; only use your left/right arrows to rotate! Be careful not to rotate too much or too often, as your paddle power decreases every time you move; if you deplete your entire bar, your game will end. Staying still will slowly recharge your paddle power. As mentioned before, each type of bullet has five different levels of strength which can be gotten by collecting power-ups. Bullet strength only increases when the same bullet type is collected consecutively; for example, collecting the power-up for Multi-shots one after the other will give me a Multi-shot bullet strength of 2. However, collecting different types of bullets will simply revert its strength to 1. Always destroy the fastest moving lily pads first, or the ones that are coming straight at you. I like splitting the biggest ones into smaller ones, as the smaller they are, the less damage you'll take if they do hit you. When starting level 1, the lily pads move fairly slow, and are relatively easy to destroy. Don't get frustrated when your bullets miss your targets, especially the smaller ones; just aim slightly ahead of the lily pads and wait for them to float into your line of fire. As you start getting into the higher levels, the lily pads start to move faster and any uncollected power-ups will keep floating around on your screen, making it difficult to see. Just keep your eye out for any fast-moving lily pads! 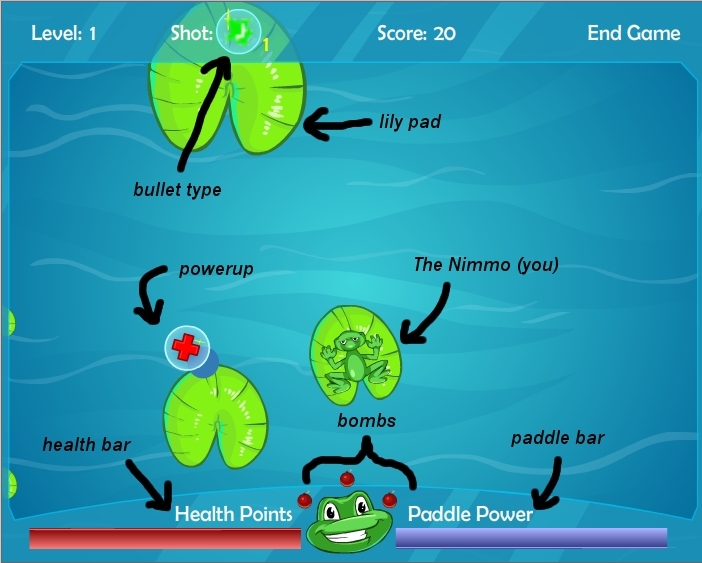 A tip on using bombs: Use bombs only when a lily pad is moving towards you too quickly to destroy with your bullets. The screen will flash, and the said lily pad should split if it's large, and disappear if it's small. If you get hit by anything in level 1 or 2, restart the game. If you see the power-up for multi-shots, make sure to pick it up! It makes your life so much easier and the game play is faster. Be sure to collect bombs and health along the way too! For slower computers, it's best to play the game on a medium size with the quality set at "low." This prevents lag in the higher levels, especially when there are lots of power-ups floating around on the screen. You can usually get the avatar around level 27.